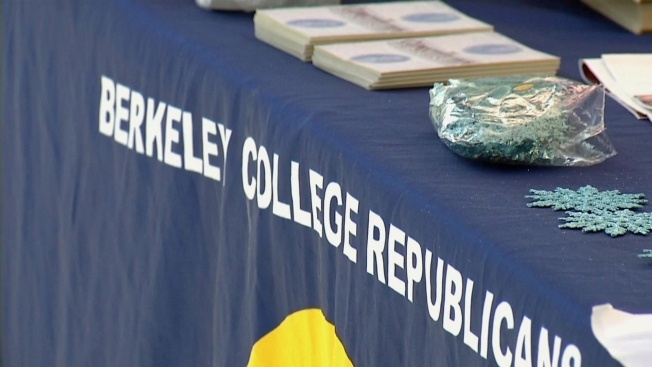 An act of vandalism at UC Berkeley has renewed political tensions for a conservative group on campus. The College Republicans say they feel increasingly threatened, and the latest incident in which a man destroyed the group's signs at its designated space in the university quad has the group raising red flags. On Wednesday, some members of the College Republicans said more needs to be done to protect their members and their property. The location of Tuesday's vandalism was at a place the group calls the Freedom Table. It's a designated space to promote their group and encourage respectful debate with Democrats. "It’s easier to flip the middle finger than to come and have a discussion with us," College Republicans member Naweed Tahmas said. Tahmas said the man who destroyed the signs Tuesday had a discussion with several Republicans at the table and then decided to make a statement by breaking wooden signs that were on display. "He said he was doing it for minorities," Tahmas said. Campus police are investigating the incident, but Tahmas says he would like to see the university do more to protect conservative students. "I’ve been spit on, I’ve had my personal information posted online," he said. "They called me Neo-Nazi." Tahmas said a "Wanted"-style flier hanging up on campus shows his picture along with several other school Republicans and describes them as "baby fascists" and goes on to accuse them of physically attacking liberal activists. Tahmas said the tension on campus has rised significantly since the violent protests surrounding controversial blogger Milo Yiannopoulus and his planned visit last month. The university sent out a letter to all students and staff condemning the vandalism. It says in part, "the university is unswervingly committed to supporting and defending all our students First Amendment rights and their ability to freely engage in political activities across the ideological spectrum." Asked if there are plans to bring Yiannopoulus back to campus to speak, the College Republicans said they would be happy to host him, to spark a peaceful debate.